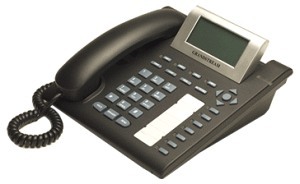 Grandstream GXP-2000 je enterprise IP telefon. Pěkný design, výborná audio kvalita hovoru, bohaté funkce a snadné ovládání telefonu. Support SIP (RFC3261), TCP/IP/UDP, RTP/RTCP, HTTP, ARP, ICMP, DNS (A record and SRV), DHCP, PPPoE, TFTP, NTP. Support NAT traversal (STUN, etc), server fail-over, SIP presence (SIMPLE).Multiline support of up to 11 lines indicators (expandable to a few dozen more through expansion key-module). Graphical LCD to display up to 8 lines and 22 characters per line.2 x 10/100Mbps Ethernet porty. Headset jack. Support Caller ID display or block, per call or permanent. Call waiting, Hold, Mute, Transfer (blind or attended), Forward, Multi-party conferencing. Power-over-Ether (802.3af).